Regarding Miho, the Fudoki states ‘Miho Shore: 288m wide., Shrine to the West, farm dwellers to the North’. This description still applies to the area as it is today. The characters for Miho have a number of written variations. The aforementioned ‘Shrine in the West’ refers to ‘Miho-jinja’, one of the ‘shikinaisha’ shrines. (Included in Official Register of Deities) The Fudoki, which contains a shrine ranking, places Miho at the very end of its list but this appears to be an oversight as its order is restored in the Engishiki. 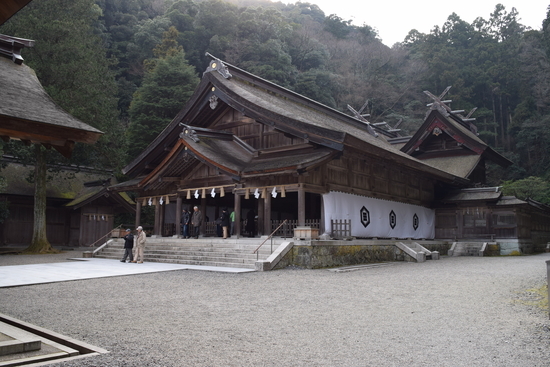 Considering the importance of the land of ‘Miho’ in the Kuniyuzuri myth, it would definitely be considered among the top of the shrines in Izumo Province. The main building is in the ‘Miho-tsukuri’ style of two halls abreast with each other. 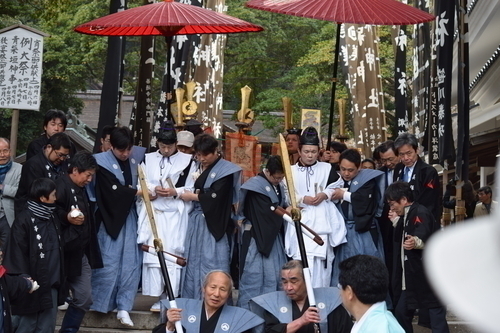 The enshrined deities now are ‘Mihotsuhime-no-Mikoto’ and ‘Kotoshironushi’. Originally it is thought there was just one god; ‘Mihosusumi’, born of Ookuninushi and Nunagaha-hime, from the land of Koshi. It’s probable that the new enshrined kami came to be after the Kojiki and the Nihon-shoki’s depiction of the Kuniyuzuri myth. It is also worth visiting the numerous other shrines outside of Miho-jinja’s precinct grounds but still with connections to it. In addition, the well known Shinto rituals ‘Aofushigaki-shinji’ and ‘Morotabune-shinji’ are both famous for recreating the Kuniyuzuri myth. Miho-Jinja’s typical festivals are the Aofushigaki-shinji held on April 7th, Kamimukae-shinji on May 5th, and Morotabune-shinji on December 3rd. 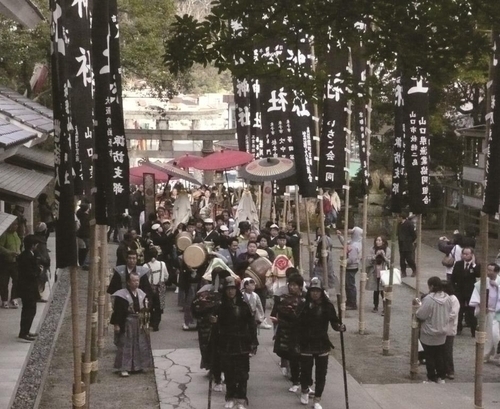 The Aofushigaki-shinji on April 7th is a Shinto ritual connected to the Kuniyuzuri (Land relinquishing) myth. The enshrined deity of Miho-Jinja, Kotoshironushi (aka Ebisu-sama) consulted with Ookuninushi-no-mikoto (aka Daikoku-sama) and was granted permission to respond to the proposal regarding the land. After accepting, he tilted the boat he had used to cross the Mihonoseki Sea and transformed it into brushwood into which he hid. After this he was returned to life as a kami and is said to lead the other gods in patrolling the area around Miho-jinja (Takamagahara). Without a doubt, the concept of being returned to life has a definite philosophical aspect. What’s more, when picturing the idea of some kind of bodyguard in armor, brandishing a hardened axe patrolling from the harbor to Miho-jinja, one never tires of wondering exactly what enemy he is protecting against. 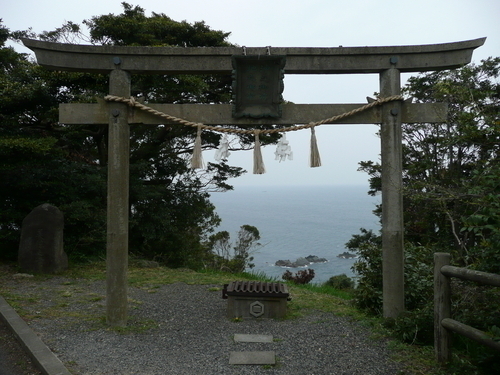 As for the May 5th Kamimukae-shinji, it involves the kami from the two islands off Mihonoseki Lighthouse: ‘Oki-no-gozen’ and Chi-no-gozen’ being welcomed from the sea to Miho Jinja’s Main Hall. This ritual takes place in the middle of the night and filming is not possible so an exact description of events is not known. The Morotabune-shinji on December 3rd is essentially the setting for when Kotoshironushi consulted with Ookuninushi regarding the Kuniyuzuri command. 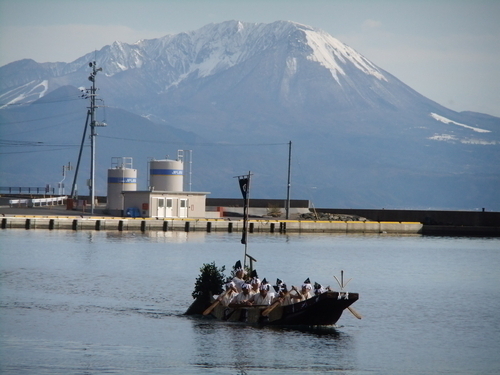 18 sailors divided up onto two dug-out canoes negotiate the choppy waters on a round trip over to Marodo Shrine (which enshrines the same deity as Izumo Taisha, Ookuninushi) located on the opposite shore to the Miho-jinja side of the harbor. The highlight of this event is when the guji (chief priest) and the other head upon arriving at the shore, exchange discourse and then perform a ‘one then three hand-clap’ action. This suggests the roots of the popular ‘tejime’ ritual hand clap commonly used to signify the closing of an event or party in Japan. The Miho-jinja kami are said to like music. The shrine repository is host to over 850 artifacts including Izumo koto instruments and other old Japanese musical items. Japan’s oldest music box is also housed here as a votive offering. As a general rule, these are not usually open to the public.